The prickly forest animal is also a classic dish in Russian cuisine. Russian cuisine offers many delicious and healthy dishes, but it also includes completely unexpected ones: for instance, these meatballs which look like friendly forest hedgehogs and are named after them. Russian death caps: Do you dare to prepare? You don't have to be a great artist to cut a tomato into a rosette or to fashion a happy piglet out of a boiled egg. Serving food in this way transforms the dinner table - making it merry and cosy. There are dishes that are enticingly original from the start, such as "hedgehog meatballs." The name comes from the rice on the surface of the meat that looks like a hedgehog's spines. 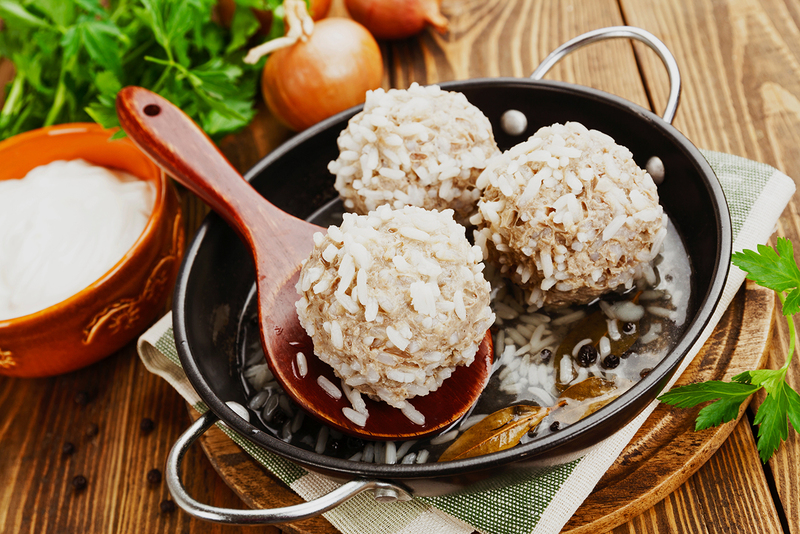 They may be ordinary meatballs with rice, but anyone who hears the name will immediately smile and want to try them. The hedgehog is a friendly character in Russian folklore, known to be clever and crafty. When faced with danger, it hides from predators using its spines, but it can also get the better of its enemies thanks to its own resourcefulness. Sometimes the hedgehog is thoughtful, such as the main character in the popular Russian cartoon for children and adults, Hedgehog in the Fog, by Yuriy Norshteyn. That film has won several dozen prestigious international awards and has been declared one of the best animated films of all times. The charming and amusing hero of the cartoon touchingly reflects on his surroundings. How can one not love a hedgehog like that? This warm feeling also extends to "hedgehog meatballs." The culinary "hedgehogs" can be made in various ways - it all depends on the cook’s imagination and abilities. The simplest way is to mix the minced meat with boiled rice, roll it into meatballs that you then steam or bake. Minced chicken, beef, pork or a combination of meats is generally used, but some cooks make fish versions or even vegetarian ones. There are also "hedgehogs" made of game - in one chi-chi restaurant serving Russian cuisine I once had venison "hedgehogs." Like other meatballs, "hedgehogs" are best accompanied by a tomato or mayonnaise sauce, or sour cream. 1. Half-cook the long-grain rice. It must be hard so the meatballs don't fall apart later. 2. Mix the rice with the raw egg and minced meat. I prefer a mixture of pork and beef. Add finely chopped onion and herbs for succulence and flavor. Now carefully mix everything together, adding salt and pepper, and form into meatballs about the size of a ping-pong ball. Each meatball needs to be lightly coated in flour. 3. Fry the finely-chopped onion on a large frying-pan (using the second onion) and the grated carrot. When the mixture begins to brown, add the meatballs. 4. When the meatballs begin to brown, add the base for the sauce - sour cream diluted 1:1 with hot water. Cover the pan and cook on low heat for about 40 minutes. 5. Boiled or mashed potatoes are an excellent pairing for "hedgehogs." And it will be even more interesting if the animal theme is continued by using farfalle (Italian "butterfly" or bow-tie pasta) or conchiglie ("shells") or any other shaped pasta. 6. Now serve, but don’t forget to add decorative touches to the table. Elegantly lay out napkins printed with merry designs, and if you are enthusiastic enough you could cut fruit and vegetables into interesting shapes. The atmosphere at the table often depends on the manner of serving. Bon appetite!